Dr. James Naigus is Lecturer of Horn at the University of Georgia Hugh Hodgson School of Music. He studied horn with Jeffrey Agrell at the University of Iowa, studied horn and composition with Paul Basler at the University of Florida during his masters degree, and while attending the University of Michigan for his undergraduate degree studied with Soren Hermansson, Bryan Kennedy, and Adam Unsworth. Prior appointments include the University of Central Missouri and the University of Iowa. He has played with the Wichita Symphony, Waterloo-Cedar Falls Symphony, Orchestra Iowa, Brevard Symphony Orchestra, Gainesville Chamber Orchestra, Valdosta Symphony Orchestra, Ocala Symphony Orchestra, Oskaloosa Symphony Orchestra, Adrian Symphony Orchestra, Dearborn Symphony Orchestra, and soloed (on horn) with many regional professional choirs in Florida. He has toured Europe in 2017&2014 and South America in 2011 as a member of the American Chamber Winds. 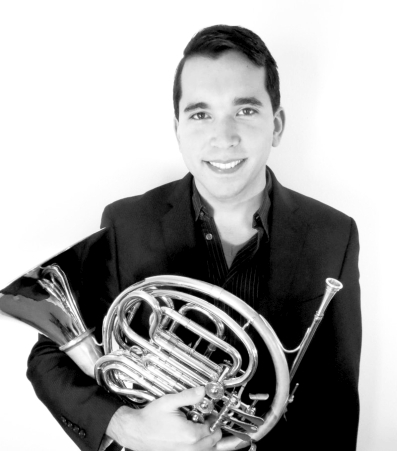 Naigus has been a guest clinician and composer-in-residence at American Horn Quartet founder David Johnson's summer workshop in Daytona Beach for several years. He has also performed on recitals at the 2014 MidNorth Horn Workshop, 2013 Midwest Horn Workshop, the 2018 and 2017 Midsouth Horn Workshops, the 2018, 2016, 2014 and 2013 Southeast Horn Workshops, and the 2015 and 2013 International Horn Symposiums. As a member of staff at the prestigious Kendall Betts Horn Camp for the last several years, Naigus has designed and taught an aural harmony music theory course. Additional teaching interests include music theory, concert and commercial composition, and film music. He is also the co-founder of the Cor Moto Horn Duo with Drew Phillips, and co-editor of the Creative Hornist and Technique Tips columns in the Horn Call, the journal of the International Horn Society. Dr. Andrew Phillips is the Assistant Professor of High Brass at Liberty University in Lynchburg, Virginia, where he teaches Horn and Trumpet. 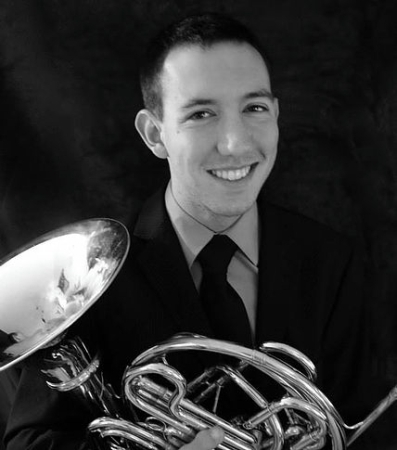 He holds a Bachelor’s in Music Education from the University of North Carolina-Greensboro, his Master’s in Horn Performance from the University of Iowa as the Teaching Assistant of the Horn studio, and the Doctorate of Musical of Arts from UNCG. His primary teachers have been Mr. Jeffrey Agrell, Dr. Abigail Pack, Mr. Jack Masarie, and Mrs. Robin Gorham. He has previously taught at Mitchell Community College in Statesville, North Carolina, and was the Brass and Piano Instructor at Upbeat Music Company in Lewisville, North Carolina. Dr. Phillips performs as Principal Horn of the Lynchburg Symphony Orchestra and the Alluvion Stage Company. He has also played with the Opera on the James, Roanoke Symphony, Roanoke Opera, Raleigh Symphony, Quad City Symphony, Ottumwa Symphony, Oskaloosa Symphony, Fayetteville Symphony, Carolina Philharmonic and is a sub for the Virginia Opera. Dr. Phillips has performed in recitals at the 2014 and 2016 Southeast Horn Workshops and the 2013 Midwest Horn Workshop. In the spring of 2017, Dr. Phillips was featured as a soloist with the Lynchburg Symphony Orchestra and East Chapel Hill High School Orchestra on James Naigus' "Radiant Dances for Horn, Strings, and Percussion," and soloed with the Liberty University Band on Gary Kuo's "Wingspan." He is also a founding member of Cor Moto, a professional horn duo with Dr. James Naigus. Dr. Phillips is an active composer with works being commissioned across the country and internationally for horn and piano, two horns and piano, two horns and brass ensemble, low brass trio, horn quartet, horn octet, brass septet, concert band, and other mixed chamber ensembles. In the summer of 2014, the Bay Brass premiered his work for two horns and brass ensemble entitled Radiance for Two Horns, with the Bay Brass accompanying hornists Radovan Vlatkovic, international soloist, and Robert Ward, principal horn of the San Francisco Symphony, as soloists. His horn octet "Exultant Fanfare for Horn Octet" most recently won the Composition Contest at the 2016 Northeast Horn Workshop hosted at Indiana University of Pennsylvania and was performed by artists on the final concert. Dr. Phillips attended the Summer Brass Institute Music Festival in San Francisco, California in the summer of 2012 as a Fellowship recipient based on audition and returned in the summer of 2013 as the Assistant Director of the Music Festival. He conducted and composed for the high school ensemble, culminating in brass septet world premieres in concert, coached brass chamber music, and played in concerts and masterclasses with members of the San Francisco Symphony.